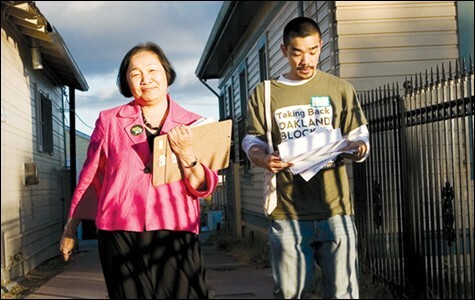 Jean Quan and her son, William Huen, walking a voting precinct in Oakland's Fruitvale district. Jean Quan's adult daughter, Lailan Huen, couldn't stand the thought of pay-to-play politics dominating Oakland city government. So when her mother asked her and her family eighteen months ago if they were okay with her challenging Don Perata, the East Bay's king of big-money campaigns, Lailan was unequivocal. "I don't want that guy to be mayor, mom," she said. "You've got to run." To outsiders, Jean Quan may have seemed an unlikely candidate to face off against the former president pro tem of the California Senate and onetime leader of the state Democratic Party. 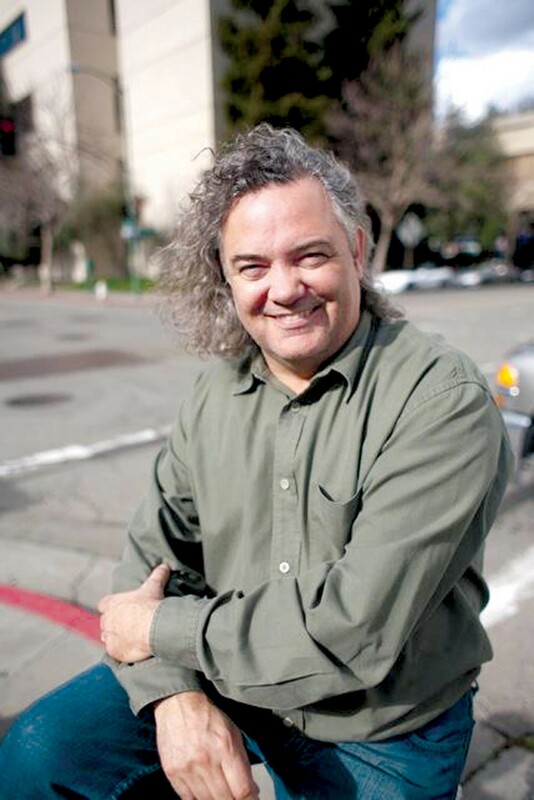 More often than not, Perata instilled fear in most East Bay politicians. For decades, they were intimidated by his stable of deep-pocketed donors and his long history of exacting revenge against those who dared to cross him. "They're so scared of him," Quan said late last week during a sit-down interview. "People were looking at me like I was crazy." Until now, Quan never had a reputation for being a fierce political candidate. She was known as a consensus builder, a well-respected councilwoman who knew the finer points of city government maybe better than anyone. She didn't have an A-list of endorsers. And when she started, she suspected that Perata and his contributors would outspend her by a margin of more than 3-1. But with her family's undying support, Quan and a cadre of close friends devised a plan for success. 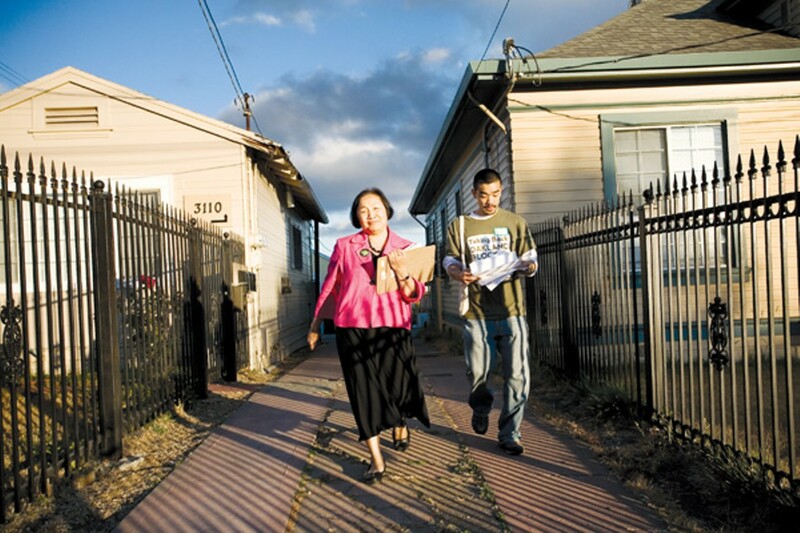 Quan and her husband Floyd Huen would take out a second mortgage on their Oakland home. They would depend heavily on her tireless passion for campaigning and on an army of volunteers — nearly 1,000 strong — who would go door-to-door on her behalf. They would attack Perata like no other East Bay politician had dared to do. And they would take full advantage of Oakland's new election system, ranked-choice voting. They knew the ex-senator would have a mountain of cash at his disposal. But they nonetheless were confident that they could beat him. What they didn't know is that he would run a clumsy, mistake-prone campaign. "The race was always predicated on the fact that Perata would have unlimited amounts of money, but my hope was that he would spend it ineffectively — and it turned out that they did," said Parke Skelton, a Pasadena-based political consultant who managed Quan's winning campaign. But Quan and her team also had to contend with Councilwoman Rebecca Kaplan, a young, whip-smart, up-and-comer who built a formidable coalition of young voters, gay activists, environmentalists, and business advocates. The Quan team knew that Kaplan could help them with ranked-choice voting, but they also were concerned that when Perata attacked Quan, and they returned fire, that Kaplan might benefit. "That was my biggest fear of the whole race — that Kaplan would make a late surge because she was staying above the fray," Skelton said. In the end, Kaplan surged, but she ultimately couldn't garner enough votes to get past Quan. Her entrance in the race also produced the payoff that the Quan team had dreamed about. Kaplan supporters went huge for Quan, picking her above Perata on their ranked-choice ballots by a 3-1 margin, and rocketing Quan to a 2,000-vote victory. Only time will tell whether Quan will become an effective mayor. But looking back on the 2010 Oakland mayor's race, there's no doubt that she outworked, outflanked, and outsmarted her competitors. She easily ran the best campaign. And her winning strategy promises to be one that political junkies will study for years to come. When Chris Quan joined Jean Quan's campaign in February, there were already 500 volunteers trying to get the councilwoman elected mayor. Chris, who is not related to Jean, had known the councilwoman when she served on the Oakland school board in the 1990s. Indeed, many of the Quan volunteers first met her during her school district days and were deeply devoted to her. Since the election, she has held two giant parties in their honor. Chris Quan's job was being the volunteer coordinator for Jean Quan's army of volunteers. Eventually, the army swelled to nearly 1,000 members, Chris Quan said. It was an unprecedented outpouring of support for an Oakland political candidate, and it dwarfed what the Perata and Kaplan campaigns assembled. 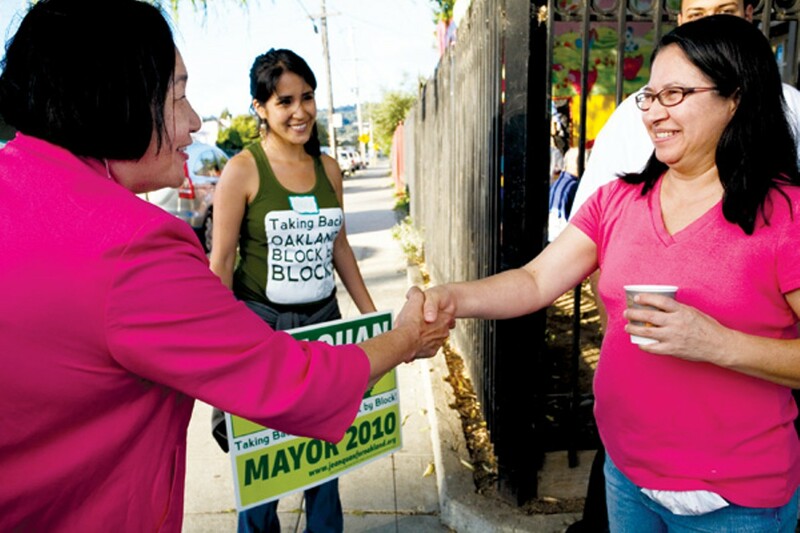 The saying "grassroots campaign" has become an empty cliché in the current era of Astroturf politics, but the 2010 Jean Quan campaign may have reclaimed its original meaning. Although many of Quan's volunteers were driven by the prospect of beating Perata, that wasn't sufficient motivation to inspire so many of them to spend months knocking on doors. The ex-senator's campaign slogan may have been "I Believe in Oakland," but Quan's volunteer army believed in her. "She believes in the collective power of us — that every person's opinion is important," Chris Quan said. "We believed in her. And she believed that together we could make a difference. And she made us believe that, too." The Quan army grew as volunteers went from house to house. If people said they intended to vote for her, they were quickly enlisted to knock on doors themselves, or phone bank for her. The campaign also targeted neighborhood opinion-makers, people who could sway the votes of residents on their block, noted Susan Montauk, the volunteer coordinator for North Oakland. 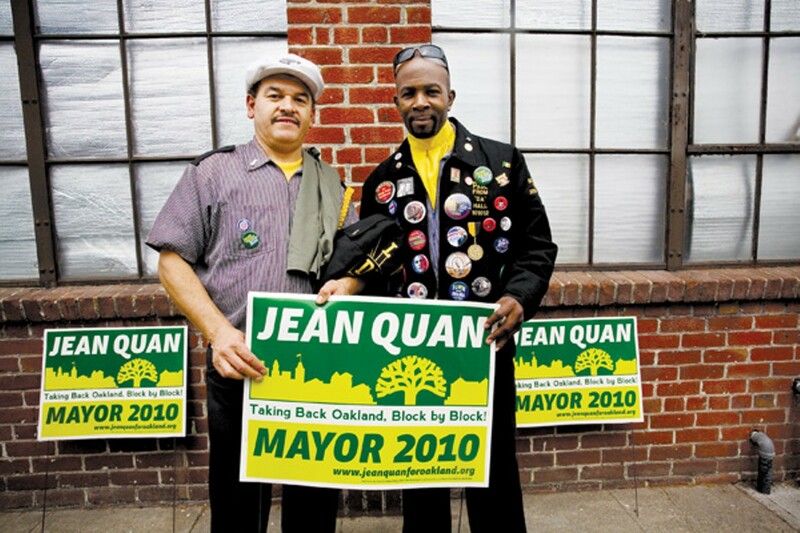 Quan's campaign slogan was: "Taking Back Oakland, Block By Block," and no one may have embodied that theme more than her husband, Floyd Huen, and longtime Oakland political activist James Vann. 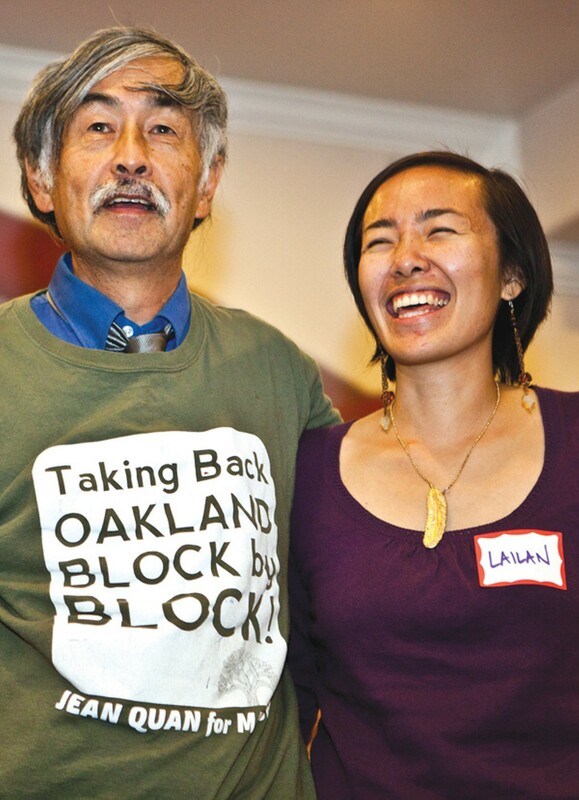 For nearly a year, the two of them walked the city, reaching two-thirds of Oakland's precincts, chatting up residents, and urging them to put Quan on their ballots. They covered more than 200 miles on foot. Readers sound off on what reporter Robert Gammon should investigate now that Don Perata has lost the Oakland mayor's race.